There presently exists limited information or studies on means to support immigrant families as they attempt to access quality services for children with autism spectrum disorder (ASD). An ASD diagnosis is the gateway to support services and adapted interventions. Yet, studies show that immigrant families typically experience longer delays in obtaining a diagnosis and more challenges in gaining access to services. Twenty-four families who immigrated to Québec (Canada) participated in semi-structured interviews in which they listed the obstacles and facilitators encountered in their service trajectory to obtain a diagnosis for their child. Families’ attitudes toward ASD, as a function of native culture, and their advice to other families in a similar situation are were also reported. Obstacles most often mentioned by participants were the waiting period for diagnostic services, feelings of social isolation, and a lack of professionals’ knowledge about ASD. Parental advocacy, the competency and expertise of the professionals who conducted the evaluation, and parental education and awareness of ASD were the most frequently named facilitators. Finally, the most common recommendations made to other parents were to be persistent and proactive. In light of these reported experiences and perceptions, a series of clinical recommendations are provided to guide ASD evaluation practices in multicultural communities. All procedures performed in studies involving human participants were in accordance with the ethical standards of the institutional and/or national research committee and with the 1964 Helsinki declaration and its later amendments or comparable ethical standards. The protocol for this study was reviewed and approved by the Joint Research Ethics Board for Public Rehabilitation Centers for Persons with Intellectual Disabilities and ASD in Québec and by the Research Ethics Board of the Université du Québec à Montréal. All the participants were clearly informed and consent to participate to the project. The other authors do not report any conflicts of interest of any kind. Barelds, A., Van De Goor, I., Bos, M., Van Heck, G., & Schols, J. (2009). Care and service trajectories for people with intellectual disabilities: Defining its course and quality determinants from the client’s perspective. 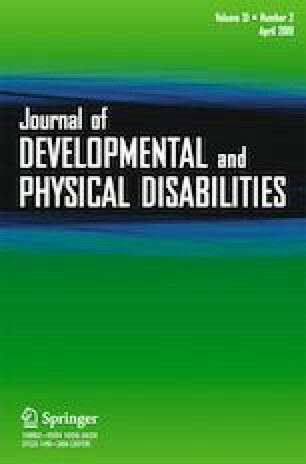 Journal of policy and practice in intellectual disability, 6, 163–172. doi : https://doi.org/10.1111/j.1741-1130.2009.00224.x.